Caroline and Eleanor Plunkett are sisters. Born a year apart, they couldn't be more different. Caroline was always the studious one, setting herself up for a great career, while Eleanor was just getting by at school. The consequences of one night mean that Caroline finds herself separated from her family and living in England with a distant relative. Eleanor much rathered spending time with her boyfriend and had no time for school work. Things haven't gone smoothly for the sisters and each has had tough times in their life for various reasons. What they don't realise is that they have more in common than they think. When a school reunion invitation makes it's way into their respective letterboxes, both women find excuses as to why they can't and won't, but what they don't realise is that the invitation is going to open old wounds and bring back memories that they would rather forget. Once again, Roisin Meaney has written a real cracker of a story. Roisin is a very talented story teller and one of the best Irish authors that I have come across, and in my opinion, she does not get the recognition that she deserves. The Reunion is full of emotion, making me cry both tears of joy and tears of sadness. I loved that it focused on relationships within a family, showing that no matter how perfect a family looks on the outside, everyone has their own battles to fight. Once I started this book, I just couldn't put it down, even having a very late night in order to finish it. I loved the characters in this book, especially Caroline. I loved her from the very first page and my heart broke into a million pieces for her. The characters of both the sisters are so well developed and I loved the back story that came with each of them. I adored how the book jumped through time, going back to when the girls were at school and then jumping to the present day. I love it when a story is told like this, because I feel that it is a real window into the lives of the characters, that you wouldn't get if the characters were just looking back on the past. The reunion deals with so many issues, many of which are very sensitive and are dealt with beautifully. Even though the book takes in quite a serious tone, it is still fairly light hearted and left me feeling warm. What each of the sisters have been through is tough to read, but makes the characters so much more relatable. The Reunion shows how two people from the same family can live very different lives, how events can change the person that you become and that all families have their problems. I adored this book from beginning to end. I wasn't expecting it to take on such a serious tone, but loved how the story turned out. You can see Roisin Meaney's heart and soul on every page. 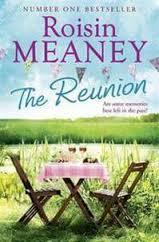 The Reunion is full of compassion and is beautifully written. I adored every last page.